Right – having sent out a load of emails to friends and family Today saying I'm now officially doing this blog, many of you have replied with the most wonderfully supportive and interested messages. Many many thanks – and indeed the reason i've decided to go with this blog and open up a bit about the experience is because so many said before I left And now during how much they envied me. I feel i'm at some level doing this on behalf also of many who'd like to be simillarly crazy. So, writing this from Le Puy, after a miserly 36.44 miles today, albeit over the Massif Central with some quite stunning views, let me briefly present my partner on this journey, Raven. See picture. She is a coupled (as in, can be taken apart into two pieces) steel-framed tourer from one of the world's best cycle shops, St John St Cycles in Bridgwater. Light she ain't, but solid she is. Black and sleek, hence Raven – which is also the generic name for the 14-speed integrated hub built by Rohloff in Germany. The quality of a Mercedes, and for those who understand these things, you can change standing still, and from top to bottom in one twist. Perfect. We have a very healthy relationship – and given that the trip as a whole is about relationships, we're getting on gratifyingly well. Panniers waterproof, utterly, from Ortlieb also in Germany. And something very new – ceramic rims, which means fabulous braking and much less wear on the pads. 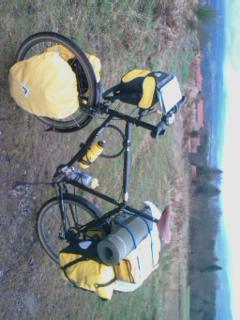 Mighty pannier carriers, and the Brooks saddle, now thoroughly tamed and almost comfortable. This is proving a wonderful bike trip. 645 miles so far in total from Cirencester, averaging 60-70 a day with reasonable comfort. Reached Le Puy today as start of the main French part of the Camino de Santiago pilgrim route to Spain. But while most in the pilgrims' hostel I'm staying in here are heading West down into Spain, I head north-east for St Etienne tomorrow to visit old university friend John Laxton, French resident since the early 70s. And then it's on along the Camino backwards through Switzerland and Austria heading for Budapest. And then back home, all by bike!! At least that's the plan. It will change.